It's funny to think that a cutting edge game released just after I was born can now fit in the palm of my hand. The future is truly amazing. The real question is, has the game aged well? Overall the answer is yes. 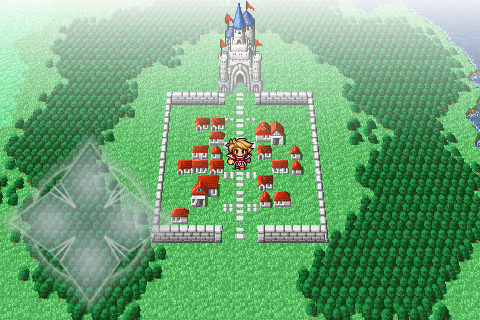 This is Final Fantasy without the frills and advancements of the modern gaming scene, but that's not a bad thing. There are random battles, no side quests, and just enough story to keep the adventure going. At the start of the game I got to create my own party, something fairly novel for a Final Fantasy game. I think every other Final Fantasy has set names and ability paths for characters. I wanted the traditional Final Fantasy experience so I made my party with a Warrior, Thief, White Mage, and Black Mage. After a few minutes with the character creator the adventure of Bashy, Stealy, Healy, and Blasty began. I'm awesome at naming, I know. There is no hand-holding tutorial to speak of. There are a few NPCs with advice inside the first inn, but their information is easily missed and not actually that helpful. For the most part the game was just thrown at me and I had to figure it out. I kind of liked it this way. The battle system isn't confusing to the point where I actually needed a step-by-step walkthrough anyway. 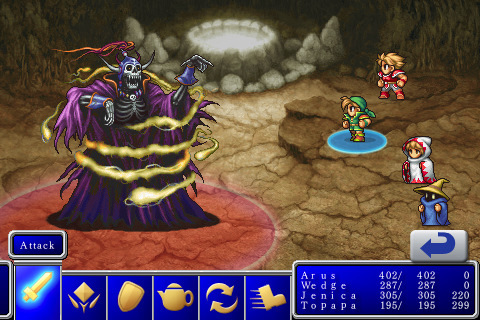 Nothing breaks from typical RPG conventions in Final Fantasy I. No doubt this is because Final Fantasy I was the game to pioneer many of these conventions. It's interesting playing the game that helped found an entire genre. Character classes, health, mana, magic, attacks, equipment slots, turn based battles, levels, stats, different modes of transportation, exploration, dungeons, and an overworld map are all present. The music is wonderful. Only so much could be done with music in the 8-bit era, but Nobuo Uematsu is a fantastic composer that always seems to get the most out of whatever the game system can provide. He was the composer for all Final Fantasy games up to Final Fantasy X. His compositions from the Final Fantasy series have been burned into the collective memory of RPG veterans like myself. In my mind he's the best composer to ever be a part of the gaming world. I'm finding the magic system to be intriguing. At every magic level there are four possible spells to purchase but only three slots to fill. I usually want all four spells, so I have to make an interesting choice when deciding which to buy. And isn't that what games are all about, interesting choices? 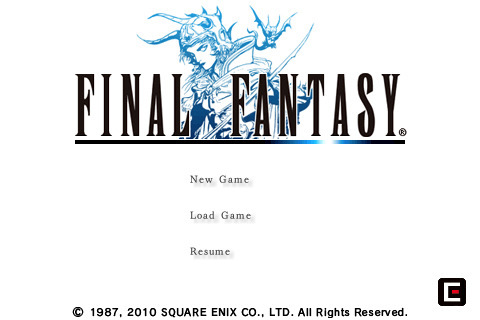 I'm playing the ipod touch/iphone version of Final Fantasy I and that comes with some benefits. Not only is it portable but I have to say I love the graphics. The blocky 8-bit sprites are gone. In their place are crisp and detailed sprites that still retain the feel of the original artwork. The typical battle menu that needs to be arrowed through is gone because the ipod is a touch sensitive device. All of the battle options (Attack, Magic, Defend, Item, Equip, and Flee) are given space in a touch sensitive hotbar at the bottom of the screen. It's a good design choice for the platform which makes selecting actions easy. My general impression of Final Fantasy so far is that it's a "typical" RPG but it's put together extremely well and is still fun to play after 24 years. It's actually more fun than a lot of RPGs I've tried lately. Final Fantasy was the first JRPG that I played, way back on my NES. It was tough as nails back then - I'm wondering how the iOS version stacks up in that regard? (In particular, I remember the Marsh Cave being an area that I had to repeat multiple times before finally conquering). Also, I'm curious as to if they "fixed" the battle system. One of the things that made the original version tough was that if you queued up an attack on a monster, but that monster died prior to your attack then the attack was totally wasted. This meant that you had to get really good as estimating how much health a critter had, as well as how much damage that your characters did. The difficulty is still way up there. I can't compare it to the original because I never played it on the NES but there are parts where I have to take extra time to level my characters and gear them up, otherwise I'll wipe in a dungeon. The battle system is "fixed" as you've described it. I can queue up all my attacks on one enemy and if they die the attacks will automatically switch to another. The original also used "magic spells" like D&D; you only had so many to use per tier, per level, per rest period (so if you used up all of your level 1 Heal spells, you were out of luck until you went to an inn... which was unpleasant while dungeoneering). I heard they moved to a MP system at some point in the remake process. I played the original... and wound up really disliking it. The MP system is much more forgiving. Interesting, I didn't know that. The MP system in FF1 is still all about using mana wisely. The total MP of mages is really low, so I always have to think before I cast. It makes for some interesting resource management in dungeons.